Hey everyone. I'm back working now, working on goodies for our upcoming MAX Southern League All-Star game and the ALFA Home Run Derby. Look for that on Sunday, I believe. I handled prospect analysis and the Joey Votto feature. The World Cup continued today with the first semi-final match. Here's a look. Italy def. Germany, 2-0 (in overtime): These teams were completely even in every way except for one. The Azzurri cared more about what was happening late in the match. There's a temptation, after 90 minutes of play, to get tired and apathetic in overtime. You'd think Germany wouldn't fall victim to that, but it happened. We saw it. Italy scored at 119' on a really nice one-time from the left foot of Grosso. Great pass from Gilardino. 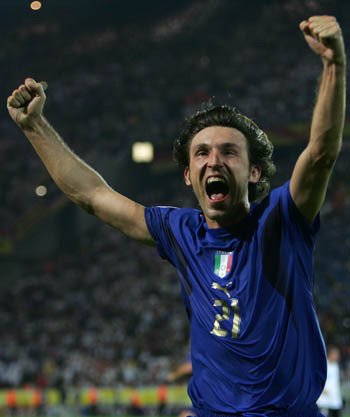 Italy then scored a minute later on a counter-attack; the run was consummated by a blast from super-sub Del Piero. Germany was not into the match during that second overtime. Grosso's goal was good, he deserves full credit, but German defenders probably could have been in better position if they hadn't vaporlocked from fatigue. My friend Bradley Handwerger, the Decatur Daily ace who shares my affection for the WC, is upset that the Azzurri has made the final. I feel the same way. I don't like these guys very much, some of them are going to get busted in the Serie A game-fixing scandal, but they're playing well. Buffon, the Italian keeper, has been the tournament's best. Alessandro Del Piero scored Italy's second goal on Tuesday. Pirlo enjoyed watching his teammates win the game. It's all about the team. 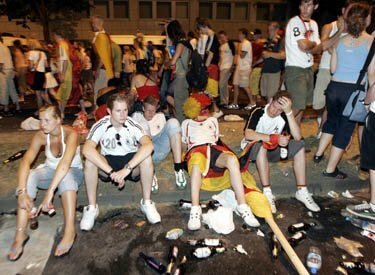 Hard times for the German fans, who are drunk at midnight and really unhappy. Italy (5-0-1) plays France/Portugal winner on Sunday, 12:55 p.m.
Germany (5-1-0) plays France/Portugal loser on Saturday, 1:55 p.m.